What marvellous good news. Easter is a time of great joy. Christ, our hope, is risen! Imagine the joy of the apostles, the women, the disciples, and of Mary, His Mother. All of them ready to go around the world singing to His glory and announcing His message of redemption and salvation. Let us ask Him to make us alive in the Resurrection as people who are God-centred, people who follow Jesus, people who serve each other in the Church. My dear Brothers and Sisters, we are called to proclaim this message of hope! We are called to spread the Gospel of Hope and to make “Disciples of all nations”. This is our common mission! It is not a mission just for Bishops, priests and religious, but a mission that is entrusted to all of those who have been baptised into the life, death and resurrection of Jesus. To be disciples and to make disciples, we must first fully partake fully in the new life that the Resurrection gives us. The life, joy and peace of Easter are ours for the taking. Let us ask God today to move us to accept the Easter message into our heart and our lives. Let us ask Him to make us alive in the Resurrection as people who are God-centred, people who follow Jesus, people who serve each other in the Church. It is a conversion of our own hearts, so become apostles of the risen Lord in proclaiming His truth, His Joy and His peace to all the nations. While we may struggle to make the world respond to God’s expectation for it, we must always nourish, through prayer and service to others, the hope we have through the Risen Christ for achieving His new life. This is hope in the true and real promise of the Gospel, the possession of everlasting life in joy and peace with God. This change must be personal. It is a conversion of our own hearts, so become apostles of the risen Lord in proclaiming His truth, His Joy and His peace to all the nations. Jesus now sends us on a mission. May we who have witnessed the Resurrection of Our Lord and Saviour Jesus Christ, find hope and courage to go out and change the world, preaching the Good News that Jesus is the Son of God, who takes away the sin of the world and grants eternal life to all who ask. 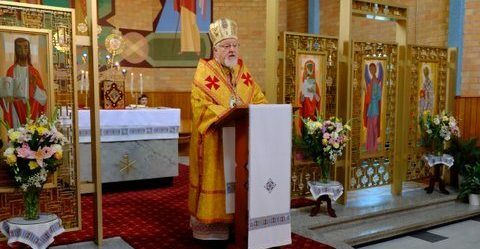 His Beatitude Patriarch Sviatoslav has convened the next session of the Patriarchal Sobor (Assembly) to take place in Lviv in August 2020 on the theme “Immigration, The Diaspora and the Global Unity of the Ukrainian Greek Catholic Church”. Over the next 12 months our Eparchy will be exploring this important theme. I encourage you to participate as disciples in this process and to fully live our Ukrainian faith not just for ourselves but as missionaries in the world. On this Feast of the Resurrection of Our Lord, I pray that God’s love fill your heart and that of your families, and bring joy and peace to all. With all my blessings for a hope filled Easter.